Simply irresistible! Full of gourmet nuts and chunky fruit and seeds, put simply, it’s our gluten free muesli in a bar. CONTAINS: ALMONDS, HAZELNUTS AND PECANS. 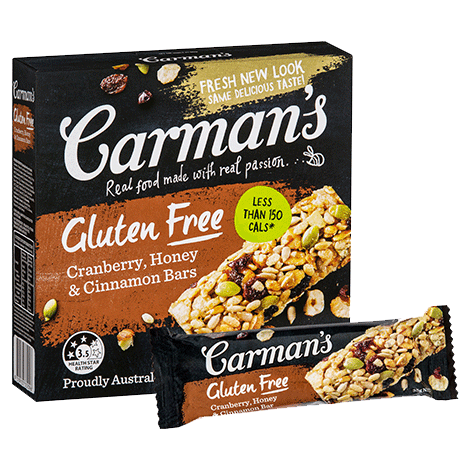 Carman’s Gluten Free Muesli Blend 80% (Seeds 24% [Pepitas, Sunflower Seeds], Fruit 19% [Cranberries 9% [Cranberries, Sugar, Sunflower Oil], Currants, Sultanas, Raisins], Rice Flakes [Brown Rice, Fructose, Emulsifier , Salt], Puffed Rice [Rice, Emulsifier , Salt, Vitamin E], Rice Flour, Honey 6%, Sunflower Oil, Nuts 2% [Almonds, Hazelnuts, Pecans], Psyllium Husk, Cinnamon, Antioxidant [307b]), Glucose, Natural Vanilla Flavour.